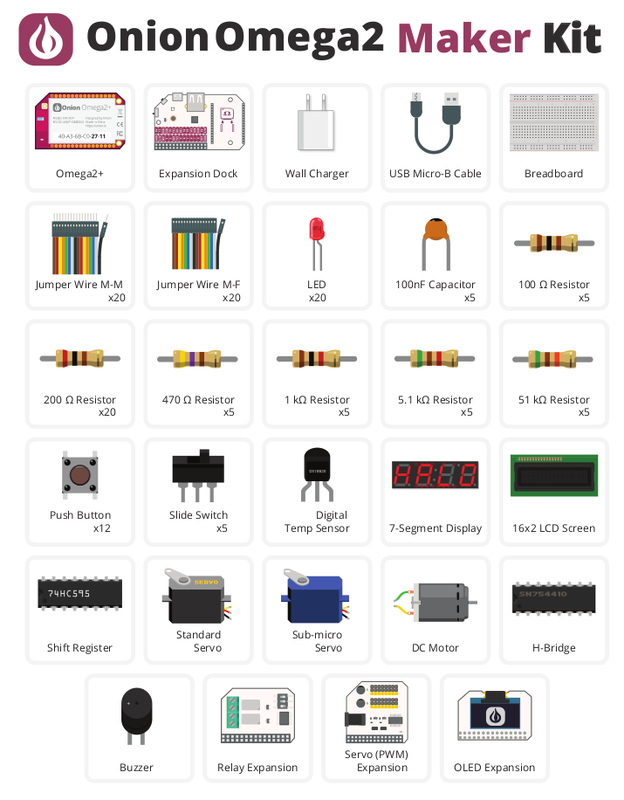 Welcome to the Guide for the Onion Omega2 Maker Kit! This is an essential skill for electronics prototyping! Your Maker Kit contains the following items; we’ve labelled them here for your convenience. Learn the basics of programming the Omega by turning an LED on and off. Create a cool LED fading effect using the pulse width modulation technique. Use a physical switch to control an LED through the Omega. Use a shift register chip to control 8 LEDs using only a few GPIOs. Add a seven-segment display to the previous circuit to display numbers. Use a 1-Wire temperature sensor to read the ambient temperature. Use the I2C protocol to control an LCD screen attached to the previous circuit.